...is Ryan's 15th birthday. 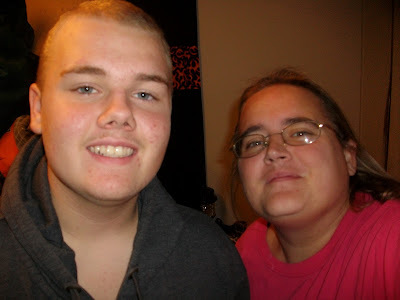 I seriously can not believe it has been so many years since they place my sweet boy in my arms and I became a mother. That's all I ever really wanted to be, and I am so glad that God no only blessed me with him, but with his sisters as well. I remember when I found out I was pregnant with him...I so hoped that he would be a girl. I never imagined I'd have a son. Whenever I thought of having kids when I was younger, I just assumed I would have daughters. I am so glad that God knew better than me and He gave me Ryan. I can not describe my love for him...it's different than my love for my girls, if that makes any sense. I love that he teases me...and that I now have to look up to look him in the eyes. Seriously, he's a good five inches taller than me now. When did THAT happen? I love that he wants to do everything with his dad, and learn everything his dad knows. They are seriously stuck together like glue, and I love that. I know a lot of 15 year old boys who want nothing to do with their parents. I love that he talks to me about everything, even the stuff I don't want to know about. He knows I'm his friend, but he also respects me as his mother. And I think that is important. I was in labor with him for 36 hours before they finally cut him out of me. He was also 12 days late. I guess if he had his way, he'd still be in there, because he sure as heck didn't want to come out. I was so tired when they finally did the section (he was born at 8:21 pm) that I don't remember holding him until the next morning. They say I did hold him, and that I asked for him to be taken away because I was afraid I would drop him. I don't remember any of that. I do remember, though, that next morning when they finally brought him to me, that he was the most beautiful baby in the world. He weighed 8lbs 13oz at birth, and the nurses all called him monkey. I never knew I could love someone as much as I loved that baby at that moment. Sure, I love my husband, but I think a mother's love is more protective and primal, if that makes any sense. Anyway, tomorrow, my baby is one year closer to being a man. If the past 15 years are any indication, he's going to be a wonderful man. Any girl will be lucky to have him. That is, if they can get to him through me. After all, I am his mother. How beautiful !! Happy birthday, Ryan !! What an incredible post! Congratulations to you both! You have a Fantastic Day!! !